Hello, loves! 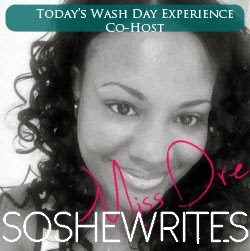 Today I'm co-hosting The Wash Day Experience with KLP & Keyda from Saving Our Strands. 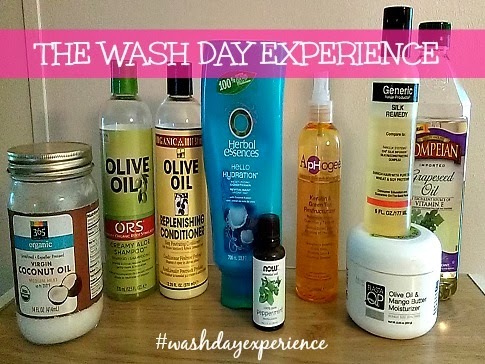 We're sharing on our blogs today about one of the most important routines within the hair care regimen, the wash day. We encourage you all to join in and take part in this experience as well! My most recent wash day was on Sunday, March 2, 2014. 1. I begin my wash day experience with pre-pooing. Instead of using a conditioner + an oil of my choice per usual, I simply applied oil to my dry hair the night before I did my cleanse. I massaged my scalp and coated my hair generously with Extra Virgin Coconut Oil. Then I covered my hair with a plastic cap, stocking cap, and hair scarf and left it overnight. 2. Since this was my first cleanse after relaxing my hair, I used a clarifying shampoo the next morning instead of co-washing with conditioner. I used ORS Creamy Aloe Shampoo, which is currently my staple clarifying shampoo. I cleansed and rinsed my hair twice with shampoo and warm water. 3. After washing my hair, I used a tee-shirt to remove some of the excess water from my hair before applying conditioner. I conditioned with ORS Replenishing Conditioner, a great light protein fix, under a plastic cap while in the shower. 4. After rinsing the ORS Replenishing Conditioner, I applied my Herbal Essences Hello Hydration Conditioner (infused with peppermint oil) to my hair and let it sit for about ten minutes. I used the Herbal Essences to add a little moisture back into my hair and added a few drops of peppermint oil into the conditioner to stimulate my scalp. 5. I completely rinsed the conditioner and removed as much excess water as I could with a tee-shirt. Then I sprayed Aphogee Keratin and Green Tea Reconstructurizer all over my hair. 6. I moisturized my slightly damp hair with Elasta QP Olive Oil and Mango Butter Moisturizer and sealed with grapeseed oil. Then I applied just a bit of GVP Silk Remedy to my hair, paying close attention to my edges and ends. I finished by gathering my hair into a loose bun and tying it up with my silk scarf to air-dry for the rest of the day. RESULTS: My hair felt very soft, strong, and thoroughly moisturized. It didn't feel heavy, as it does sometimes when I use the Elasta QP Moisturizer. And it smelled great! That counts for something, right? Now how was your wash day? Go ahead, tell us on your blog and LINK UP! ​Follow your host SavingOurStrands via Bloglovin', Twitter, Instagram, or Pinterest. Share it! Your blog post must link back to this site so others see. 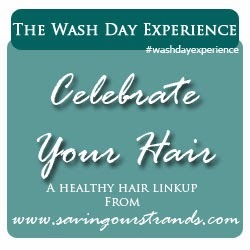 We even made this nifty button below which links back to The Wash Day Experience page! Just copy and drop the code from Saving Our Strands into your blog post. Encourage the wash day experience contributor that linked up directly before you with an inspiring comment. We are each here to support each other and build a community of determined women and hair-friends. Don’t worry, the chica ​who links up after you will do the same; comment love for everyone!